Pierce your pumpkin all over, then microwave for 10 minutes to soften. Remove and allow to cool. Once cool to the touch, cut the pumpkin in half and cube one half of it (you do not need to remove the skin or seeds). 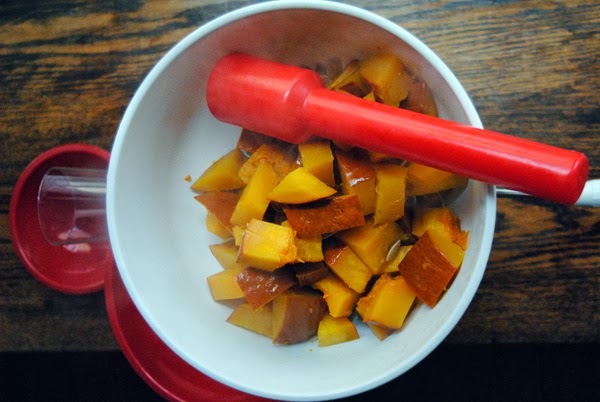 In a large saucepan, melt the butter on high, then fill the pan with the pumpkin cubes and pour in water. Cover and cook 10 minutes, or until soft. Place the cubes into the hopper of your Roma Strainer with the pumpkin screen attached, and puree. Unroll your pie crust over a pie plate, pierce in the center and sides, and pre bake for ten minutes. Place the puree into a large bowl. 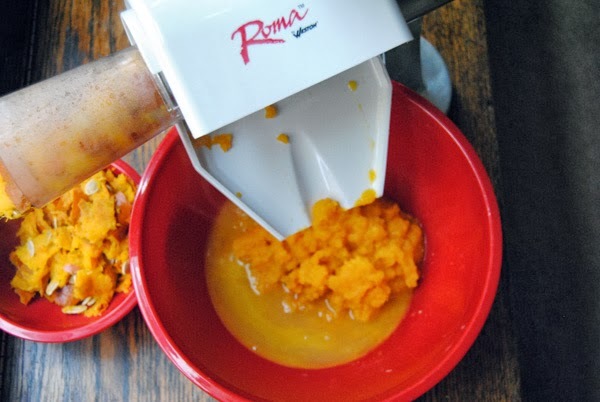 Use a Roma 3-in-1 Grater (use the garlic plate) to grate the orange peel and hazelnuts into the puree. Save a little of the zest and nuts to grate over the top of the pie. Mix in remaining ingredients. Once the pie crust is pre-baked, pour in the filling, grate the orange peel and hazelnuts over the pie, then bake at 450 for 15 minutes. Lower the temperature to 350 and bake another 35 minutes, or until the filling is solid. Pumpkin pie filling poured into the pre-baked crust, decorated with leaf-shaped pie crust pieces, then sprinkled with orange zest and grated hazelnuts. Allow to cool, then refrigerate. Serve chilled. 1. 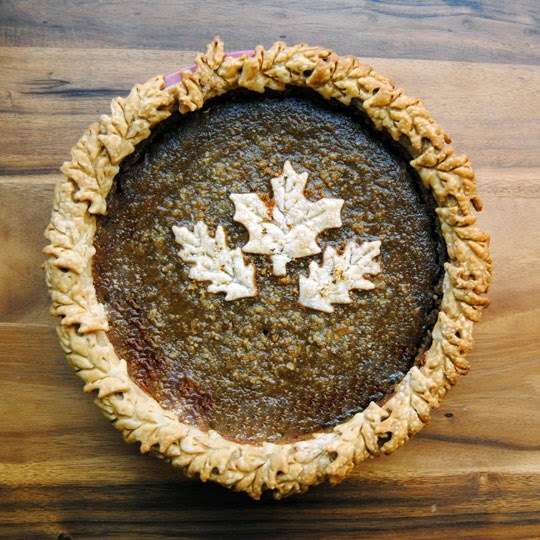 We used pie crust cutters to make our leaf crust and accents. If you'd like to get the look, get a second pie crust, and these cutters that we found at Williams-Sonoma. Cut the crust using the cutters, and pre-bake your accent pieces (those that are going over the filling) at the same time you pre-bake the pie crust. 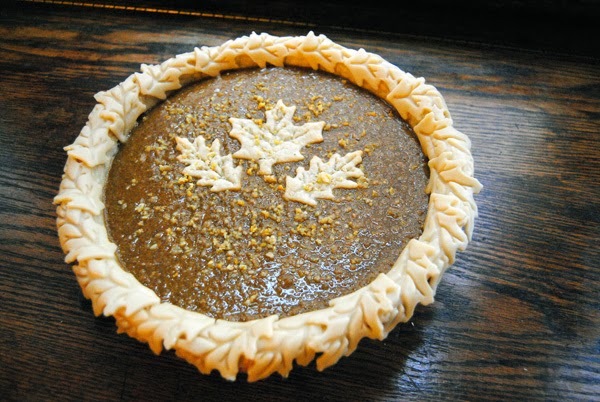 Once the crust has pre-baked, fill it, then wrap the unbaked leaves over the crust edge. Arrange the pre-baked accent leaves over the filling, then bake. 2. If you'd like to make use of the entire pie pumpkin, either make two pies, or make homemade canned pumpkin to save for your next pie. To make canned pumpkin pie filling, follow the instructions above, however, leave out the butter when you cook the pumpkin. Puree as instructed, then mix in the brown sugar, vanilla, orange zest, hazelnuts, and spices. Use a Weston Canning Kit to can the filling. Store in a cool, dry place. 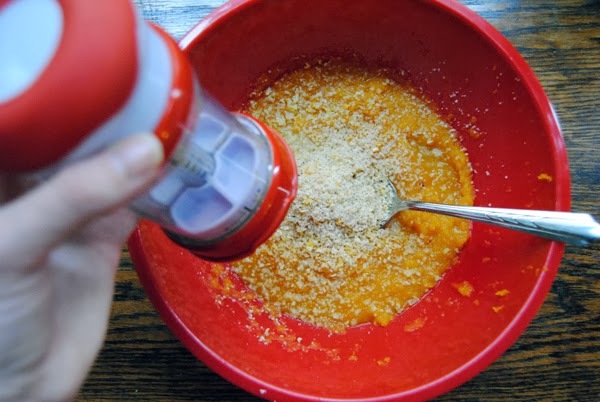 When you're ready to make your pie, mix the butter, almond milk, almond flour, and eggs into the canned pumpkin. 3. 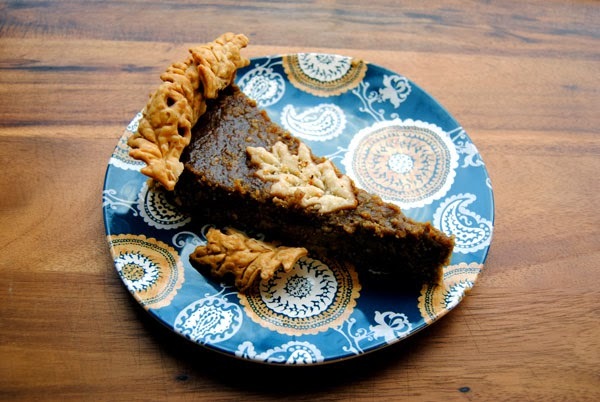 To make a vegan pumpkin pie using this recipe, leave out the butter and eggs. Use Bob's Red Mill Egg Replacer to bind the filling (follow instructions on package as to how much to use). You'll likely need to make your own pie crust. We like this recipe from Food 52 for a vegan pie crust.